3 bedroom house sleeping 6, plus separate one bed studio sleeping 2. Our Leura Place, located in the fabulous Blue Mountains of New South Wales, is a traditional 1920's miner's cottage with an open fireplace. It has been sympathetically renovated and extended to provide accommodation with a real mountain feel, and all modern conveniences. The main house has three bedrooms, and there is also a studio with an ensuite bathroom. The house and studio are set on a large, fully fenced block, with native trees and conifers, and abundant bird life. The main house has 3 bedrooms, one with a queen bed, one with a double bed, and one with two single beds which can be configured as bunk beds if required. There are beautiful timber floors, and carefully chosen furniture and period decorations throughout. There is a comfortable lounge/dining room with an open fireplace; a well equipped sunny kitchen, opening onto a family room with pool table and TV/DVD/CD; a large modern bathroom with shower and separate bath; a separate laundry with an additional toilet. The family room has french doors on both sides, opening out onto a sundeck, and also onto a covered verandah with a gas 4 burner BBQ with hood. The kitchen/family room has reverse cycle air conditioning, and all other rooms have individual room heating. There is Wi-Fi and a phone for local calls only. The fully renovated Studio is separate from the house. It is carpeted, with a queen size bed, reverse cycle air conditioning, a phone for local calls only, TV and ensuite shower and toilet. French doors open onto a paved patio with garden views. In the house there is a full bathroom (shower and bath) with an extra toilet in the laundry. In the studio there is a bathroom with shower and toilet. There is an air conditioner in the kitchen/family room of the main house, and an air conditioner in the studio. Fireplace in the loungeroom of the main house, with individual heaters in bedrooms. Air conditioning (heating & cooling) in the kitchen/family room of the main house, and in the separate studio. The property has a 3 bedroom house sleeping 6, and a separate studio sleeping 2. The price per night is for the house only. The studio is an additional $100 per night. Extremely well maintained cottage in a quite part of Leura. There is everything you need in a holiday home. The beds are very comfortable with lovely bed linen. The studio is an added bonus. A lovely property, very tidy and well presented. The studio worked well for the grandparents too. We enjoyed our stay very much. 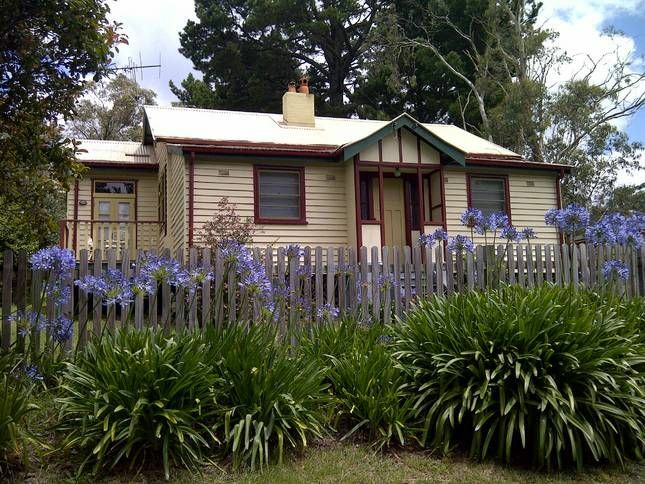 The property to be conveniently located near Katoomba and within walking distance of Leura Mall. Communication with the owners was prompt and easily managed through the Home Away App. We would definitely consider this property for future Blue Mountains getaways. We enjoyed our stay at the cottage. We also had access to the studio which accommodated all of us comfortably, a family of 5 adults, 3 children & 2 infants. We enjoyed staying in this lovely cottage in Leura, which is only a couple of mins to Leura village by car or about a 15 min walk. Really peaceful location and plenty of room. Our boys had lots of fun playing pool! It was spotlessly clean and had everything we needed including a great open fire. Convenient check in/out times, dish washer, pool and fireplace, great outdoor areas. Overall great place! Great place to stay in the Blue Mountains. Central to everything in a quiet street. This house was perfect for our stay. We had 2 families so we utilised the house and the granny flat. There was plenty of room for everyone. The kids and adults enjoyed playing snooker and pool and board games. We stayed in July so had the fire going along with the aircon which was muchly needed. There was plenty of wood (the fire was set up for us the first day which was great!) so there was no problem. We liked the cottage charm of the place and the location. Would definitely stay here again.